What makes this book unique is how easy it makes it for you to learn. The author brings you a guide that takes you through a natural sequence of lessons, step-by-step, carefully explaining each concept and staying away from unnecessary technical jargon whilst defining the terms you need to learn. This one-step-at-a-time approach allows anyone from an absolute beginner to a more knowledgeable programmer, to easily grasp each lesson and become more proficient as they progress through the book. In addition to that, this guide also contains images, examples and other tools to give you the assurance you are going in the right direction, as well as exercises that will allow you to retain up to 400% more of what you learn by practicing your exciting new skills! 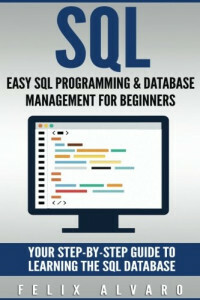 You have made the best choice by choosing to learn SQL programming and Database Management. Whether you are looking to land a high-paying job, want to delve into freelancing or want to work on your own projects, you have found the right book. Take the first step in the right direction by ordering your copy now!